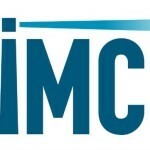 Demand: The first quarter of any year always represents a challenge for the shipping industry, with fewer cargoes being tendered and Chinese New Year in February creating recurring business issues. In terms of freight rates, the positive development that characterised most of the second half of 2017 came to a sudden end on 12 December 2017, once capesize earnings peaked at USD 30,475 per day. On 29 January 2018, average capesize earnings were quoted at just USD 14,065 per day. 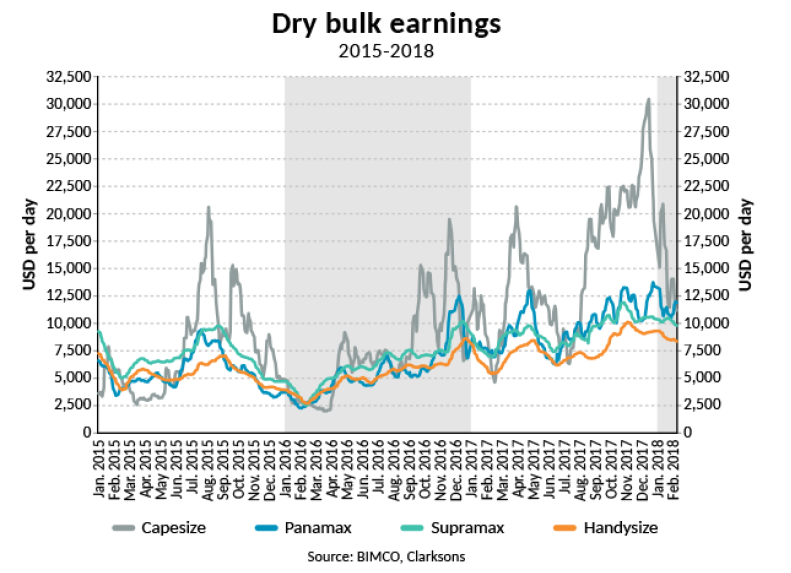 By the end of January, the freight rates for all sizes of dry bulk carriers were at break-even levels – covering both OPEX and CAPEX – but not turning profitable. Chinese New Year celebrated on 16 February 2018, marks the beginning of the year of the dog. 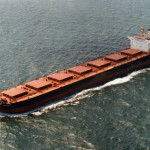 For dry bulk shipping it marks volatility, and a fall in demand round the festive days. Compared to the same time at the end of January 2017, freight rates are higher in 2018 – illustrating that 2017 did deliver significant improvements to the fundamental balance. 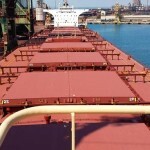 The dry bulk market has benefitted from stronger industrial production almost everywhere in the world, illustrating the synchronised recovery mentioned so often these days by the world’s leading economists. Another trend that sets 2017 apart from previous years, was the massive substitution of Chinese-origin iron ore, favouring imported higher quality ore from Brazil and Australia instead. China’s political initiatives to improve energy-efficiency and to provide cleaner air for the population led to the use of higher quality imports to limit the energy needed and emissions generated in the production process. This trend is something that we expect will continue to support the shipping industry in years to come. Indian iron ore exports fell victim to this trend as the quality of Indian iron ore is inferior to both Brazil and Australia. On the upside in Q1, we see Brazilian soya exports picking up – heading towards the pinnacle in Q2. However, this will only slightly offset the decline in soya exports in Q1 from the US Gulf, continuing to do so in Q2. In 2018, 161 million tonnes of soybean are expected to be transported. Supply: As always, January sees plenty of ship deliveries coming onto the water. January 2018 reached a ten-month high at 4.8m DWT, while 0.7m DWT were demolished. 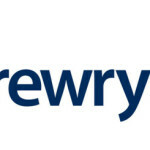 In short, the fleet is already expanding briskly, and the only comfort is the fact that the first half of any year is always busier in terms of newbuildings being launched, than the second half. As we pointed out previously, 2018 is the year of opportunity. 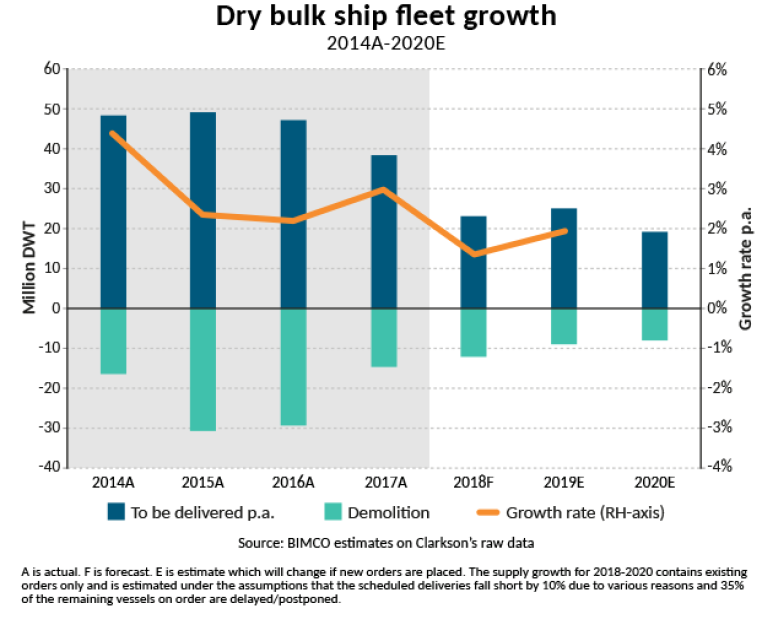 The fleet is growing at the slowest pace since 1999, and solid growth in demand means that the dry bulk shipping industry should be facing another year of improvement to the fundamental balance. The flip side of that optimistic outlook is of course that more new orders are being placed at Far Eastern shipyards by global shipowners and investors. Following 15 months of almost no orders, renewed interest in newbuilding re-emerged mid-2017, as parity for newbuilding’s with the second-hand market prices was restored, and the Baltic Dry Index (BDI) broke the 1,000-index value mark. By early February 2018, the orderbook consisted of 720 ships with a combined capacity of 81m DWT – before taking cancellations into account. The orderbook reached its highpoint in November 2008, when it consisted of 4,056 ships with a combined capacity of 332m DWT. 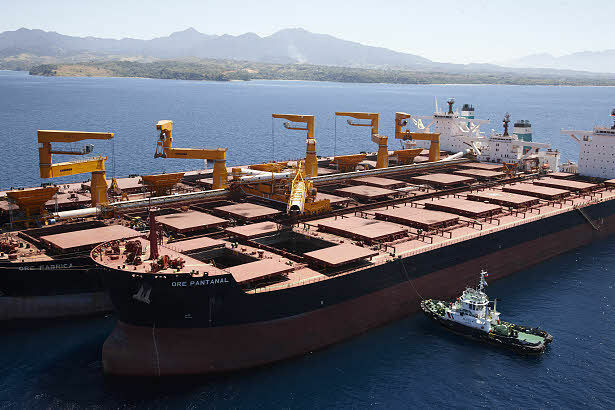 During January 5.6m DWT was ordered –including as much as 20 very large ore carriers (VLOCs) set for delivery in 2020 and 2021. Six of those are ordered against a multi-year Contract of Affreightment (COA) deal with Brazilian miner Vale. Quite a few deals of that kind were done in 2017. While this is a sign of the times, it’s also clear that industrial shipping on the main trading lanes limits the spot market for international owners and operators. Another sign of optimism is that the average age of demolished ships has been going up in 2017. Following three years of difficult market conditions that saw younger and younger vessels sold for scrap in the wake of the false dawn of 2013 – demolished ships in 2017 had an average age of 25 years. In 2016 the average age was 24 years. In absolute numbers and cargo carrying capacity, deliveries in 2018 will be minor. But in terms of average ship size, 2018 is heading for a record. The launch of 18 valemax and 31 VLOCs (200,000-300,000 DWT) makes all the difference. 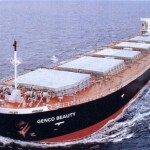 For the first time ever, the average newbuilt bulker will exceed 90,000 DWT, at an average of 92,255 DWT. Looking to the future, 2019 will beat that record, currently set for an average size of 115,000 DWT. Outlook: In 2017, the overall tonne miles demand grew by 5.1% (source: CRSL), powered by a massive lift in Chinese imports once again. Imports saw seaborne iron ore demand go up by 4.7%, and seaborne coal imports lifted by 12%. Will that strong demand be repeated in 2018? BIMCO doesn’t think so – 2017 was extraordinary. Our forecast for overall demand growth in 2018 is around 2-3%, with plenty of uncertainty surrounding that. Not just in terms of volume, but most likely also in terms of sailing distances. Longer hauls for key minor bulk commodities and grains have lifted shipping demand way above volume demand since 2014. 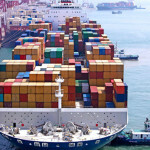 A reversal of this trend, due to traditional exporters regaining market share, will hurt demand. Seen against a fleet growth of 1.4%, we are still looking at an improved market. One of the minor bulks that may see a rebound in 2018 is cement. 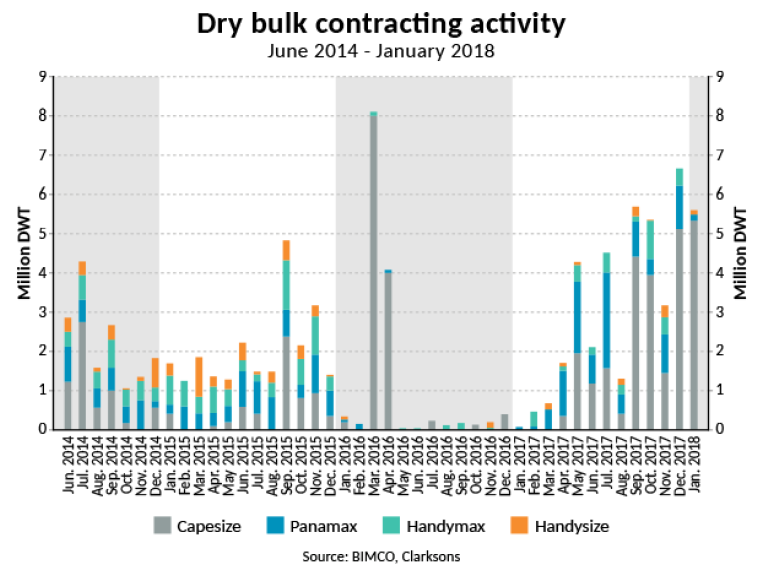 Following a decline in 2017, 110m tonnes of bulk cement and cement clinkers are expected to be shipped in 2018, growing by 3% (source: CRSL). China remains all-important in 2018 – by any standard. A few striking numbers to highlight this are: global seaborne iron imports grew by 58m tonnes in 2017 – out of which Chinese imports grew by 50m tonnes. Seaborne steam coal transport increased by 52m tonnes in 2017 – China’s imports grew by 11m tonnes. Finally, seaborne coking coal transport increased by 10m tonnes in 2017 – while China’s imports of the same grew by 7m tonnes. Separating import data between seaborne and non-seaborne trades is vital if you want a more accurate outlook of trade developments impacting the shipping industry. An example of this being Chinese coal imports that grew by 12% in seaborne terms whereas the all modality coal trades only grew by 5%.